This quilt has felt like it's been a long time coming, but in actuality I only started it in the early winter. I struggled with this quilt for more reasons than I'd like to remember and it feels a bit like my brain was wiped clean as soon as I finished the binding. So lets glaze over all of the frustrations and look at what makes it all worth while. As much this quilt challenged my patience, I have to say that it was well worth all of the effort. 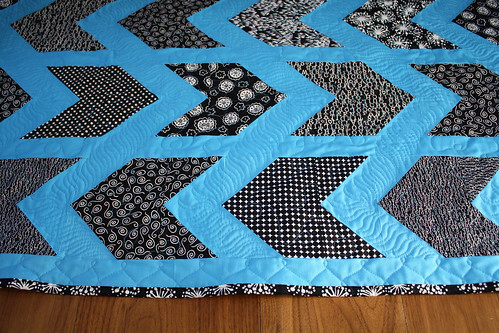 What I love most about this quilt is that the arrows form a chevron-esque pattern across the quilt top. Even after all of the seam ripping that occurred, I am really glad that I took the time to tweak the original Pow Wow pattern to get this effect, and in the end I know that I made the right decision for me. The black to white gradient layout that I did on this quilt also really speaks to my style and was a lot of fun to work on. For a backing on this quilt I went with an old favorite, Britten Number Fabric from Ikea. I used this print last fall for a quilt that I gave as a wedding gift, as I felt like this numbered print is quite fitting. Since this quilt is also a wedding gift and has a black and white quilt top, it seemed like the perfect backing option. For the quilting on this quilt I decided to out a few new FMQ designs. Inspired by the Plume Feather design in Free-Motion Quilting with Angela Walters but realizing that my blue chevrons weren't quite wide enough, I decided to do half a plume of feathers instead by making a line of slanted S shapes. In the B&W chevrons I chose to do loops, with the occasional double-loop thrown in for fun. Around the border I decided to do a slightly wider version of Angela's Wishbone pattern. 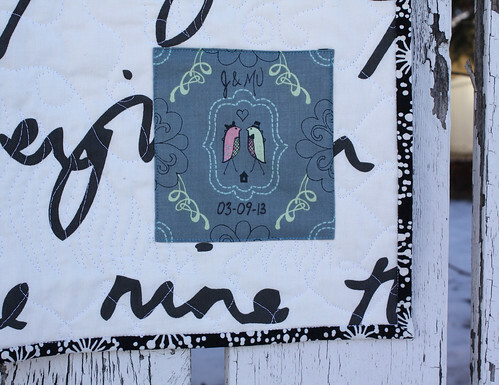 I also went ahead and made a custom label for the couple using the Love Birds in Grey print from Sarah Watts' Feather 'n Stitch fabric line, and I think they'll appreciate the extra special touch. Arn't they little love birds the sweetest? I can't wait for them to see it next month! I'm linking up to Finish it up Friday over at Crazy Mom Quilts. It's really beautiful Kelsey. 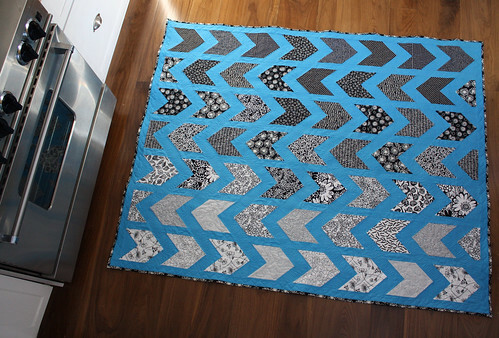 I love the FMQ you did. Ok, this is amazing...and the label is just beyond cute! Love the play of "color" across the quilt! What a fantastic quilt! The color effect with the black and white is fabulous! I love it! The black and white gradient is so cool! I am sure your friends will love it too. Great job! Lovely! 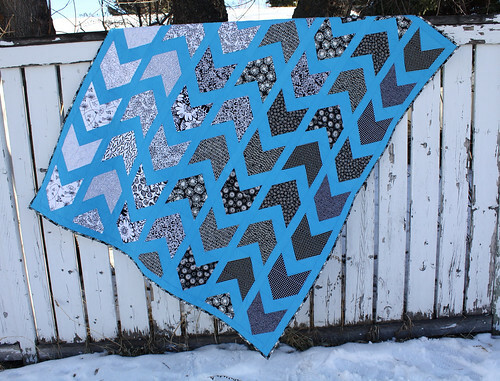 Your quilting is beautiful, and this is such a dynamic quilt. Love the choice of backing fabric too. I love your quilt. What were the modifications to the pattern? I would like to buy the pattern and create something like yours. Gorgeous!! Beautiful gradient - love! Wow! I love the way the black arrows pop against that background. Beautiful quilt! I really love the gradient of color and the quilting. I've got to get my hands on that Britten Nummer fabric. Sadly IKEA is 2 hours away from me, but when I do make it up there I'm going to buy like 10 yards of it if not the entire bolt!